This property, offered by Stewart Mountain Lodging, comes with access to other amenities and many additional properties nearby. 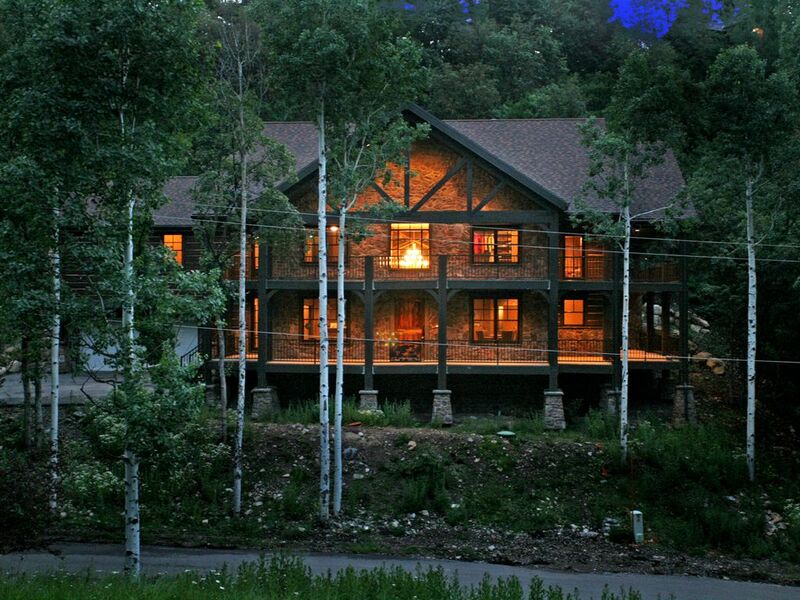 Tucked in the woods, this newly built luxurious mountain home is unlike any other in the Sundance area. With its large spaces and rich mountain decor, it's a perfect private hideout. From the saloon-style bar to the home theater and shuffleboard, the entertainment possibilities are endless. Even better, this property is almost "ski in-ski out". The walk to the Stampede ski run at Sundance Resort is less than five minutes. Let Stewart Mountain Lodging host your mountain getaway! We live here in Sundance full time - so we're always available. You'll love our private park, "The Hollow", with an outdoor fireplace and Zip Line swing. With our full concierge services we can arrange for a day of fly fishing with our favorite guides, recommend a variety of local day trips and/or hikes, or arrange a massage in your home. You'll love the personal touch and gracious hospitality of your mountain hosts. We would love to share this magical place with you. From all of us at Stewart Mountain Lodging we look forward to hosting your stay. 10 REASONS TO RENT WITH STEWART MOUNTAIN LODGING We get it. Searching for a vacation rental is a daunting task. Let us help. We offer over 30 rental properties in the Sundance area. For starters, we'll make it easy to find the right property. But, it doesn't end there. We are a professional vacation rental company, and this is what you can expect from us: 1. BEGINNING TO END GUEST CONVENIENCE We believe the experience of renting should be as carefree as your vacation. In contrast to renting through a private homeowner, our commitment is to provide you a hassle free experience from beginning to end. 2. QUALITY PROPERTIES / CLEAN AND WELL MAINTAINED No surprises. Our professionally managed properties are required to meet a standard of quality. You will appreciate our attention to detail. And in the rare case a problem arises, we'll fix it. Immediately. 3. CONCIERGE – AT YOUR SERVICE From the start, you'll know you're in good hands. From planning and booking your activities, to dining reservations and grocery shopping, we're here to help. You won't find these guest services renting through a private homeowner. 4. ON CALL, ON DEMAND - 24 / 7 We are locals who live and work (and play) in Sundance year round. That means we are at your beck and call whenever a need arises. No figuring it out on you own or chasing down a homeowner in case something goes amiss. 6. ASK A LOCAL By that, we mean us. The Stewart Family homesteaded and settled the Sundance area over 100 years ago. So we know a thing or two about the place and we'd love to share. 7. SPECIAL OCCASION? - Want flowers delivered, or have special requests? Just ask. 8. VIP SERVICES: Ask us about our private chef and private massage services. 9. EVENT SERVICES – Wedding, business retreat or family reunion? We can help. 10. VALUE EQUATION – You may find a lower rate, but you won't find a better experience. Our friendly staff can help you with all guest services. Notable Amenities Include: Wolf BBQ off gourmet kitchen, 2 fireplaces, wrap around balconies on two levels, private gate access for exclusive community, theatre room with all new HD equipment, game room with shuffleboard, dart board, and art table, kitchenette and mini dining area off game room. The Hidden Forest Lodge was a great experience. The lodge was clean and very up to date. We were not able to take advantage of the walkable slope access. We ended up driving to the resort every morning for snowboarding which was a pain for parking. The hot tub access was through the master bedroom so it was slightly inconvenient going through someone else's room. If there had to be a complaint, than that must be it because everything else was great. Wonderful stay in a beautiful house! We had a fantastic time staying in the Hidden Forest during The Sundance film festival this year. The location was perfect, the house couldn’t have been better and Stewart Mountain Lodging we’re super responsive. Thank you! We hope to be back next year!! Outstanding!!!! Clean, and exactly as described. Thanks for the feedback Matt. We are happy it all worked out for you and your group. Good to hear you enjoyed some of the amenities down at the Sundance Resort and we look forward to getting you back again soon. We just loved staying at this property, had many amenities our kids enjoyed and it was in a beautiful location. Will definitely book again when we are in town. Everything we had hoped for!!! Located on the 'Dark Side', this cabin is just a 5 minute walk up the road to the ski runs and a 10 minute walk to the restaurants, deli, and shops at the resort. This fabulous property has private gate access for an exclusive community.